On the right column, there is a list of available target file formats including Word, PowerPoint, Excel, Image, EPUB and HTML. Select one of these format as the output format. 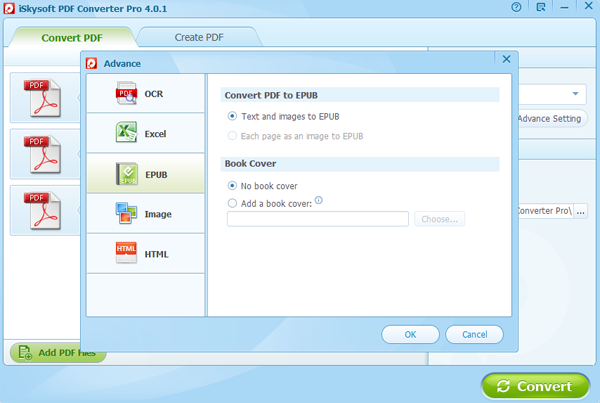 iSkysoft PDF Converter Pro for Windows enables you to convert PDF to EPUB eBook, images, HTML files etc. After you set the output format, click the Advanced Settings button to adjust the output settings of varous file types. Retain value without formatting: This is the default option and will change the original format to conform with Excel file format. Retain original formatting of forms: Select this option, if you want to preserver the original formatting of your PDF file. But if you have a PDF file containing irregular PDF tables, it'd be ill-advised to choose this option as that will result in some positioning errors. Combine all pages into a single Excel sheet: Select this option if you want to merge all PDF files into a single excel. Text and images to epub: Converth both text and image to EPUB file format. In this case, text and image in EPUB viewer can be copied and pasted to elsewhere. Each page as an image to epub: This option will convert PDF file to EPUB image which can not be edited when opened in EPUB reader. Each Page of PDF Files as an Image : This option will convert each PDF page as a single image, in jpg, bmp, png, gif or tiff format. 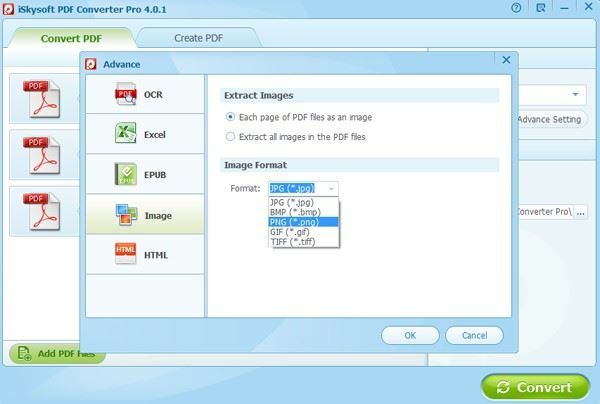 Extract All Images in the PDF Files: Convert all PDF files as a single image. Ignore Hyperlinks: Treat any hyperlinks as simple text. Ignore Images: Skip any image in the PDF documents. Simply press the Convert button and the converting will start. After it is done converting, you can click the Open button to view the converted document. Tips: Conversion of selected pages is also ok. 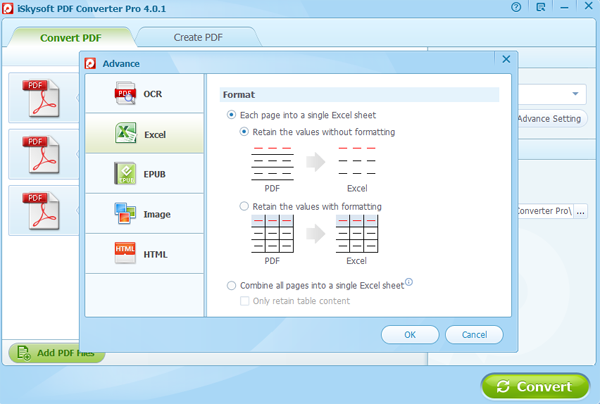 Note: OCR function is only available on the Pro version of PDF Converter. Follow the guide below on how to turn scanned PDF into text. Import scanned PDF files into the program, then select the right language for the imported PDFs and click the Enable OCR button. Note: If the scanned PDF documents are in Chinese, Japanese or Korean, you will need to install additional component. You need to select the target file output format first before proceeding to perform OCR. The list of available output formats consists of Microsoft Excel,Microsoft Word, Microsoft PowerPoint, HTML,Text, and EPUB. You can also go to the Advanced Setting to fine tune the output format. When everything is ready, press the Convert button to start. Once the converting is done, you can click on the fold icon on each PDF file to video the converted file. In addition to doing an awesome job of converting conventional PDF files, iSkysoft PDF Converter also have the ability to convert password restricted PDFs. If the PDF file is restricted to only copying ,editing and printing , you just need to press the Convert button to start the conversion.But if you cannot even open the PDF without a password, then you will need to use a password to unlock it first. 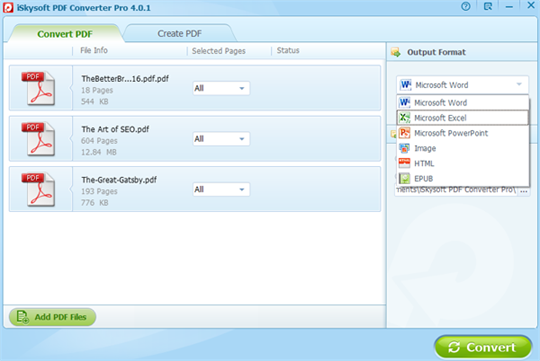 PDF Converter Pro enables you to save your Microsoft Office documents, text file and image as PDF documents. Please be advised that you should at least be able to open these files. Click the Create PDF tab and add your targeted documents to the program. It support documents formatted as Microsoft PowerPoint , Word, Excel or text. 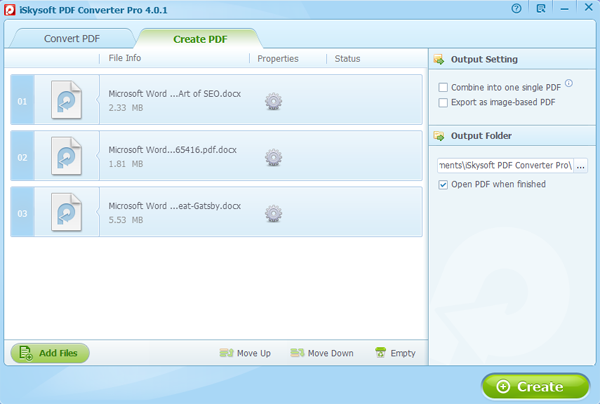 You can set your preference for the output PDF files prior to the conversion. Either you combine these files into a single PDF or export these files as image-based PDF is fine. Just check the right side of the interface. 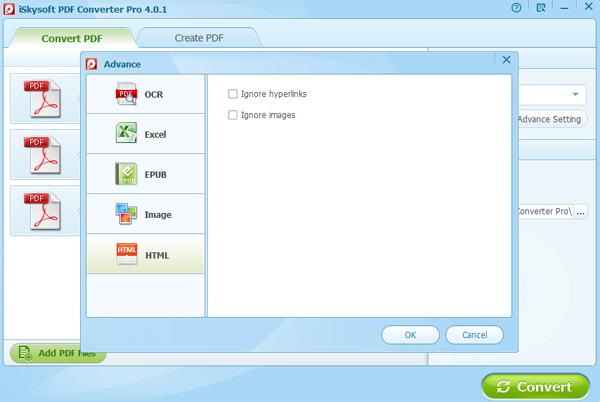 Finally, simply click the create button to convert documents to PDF files. 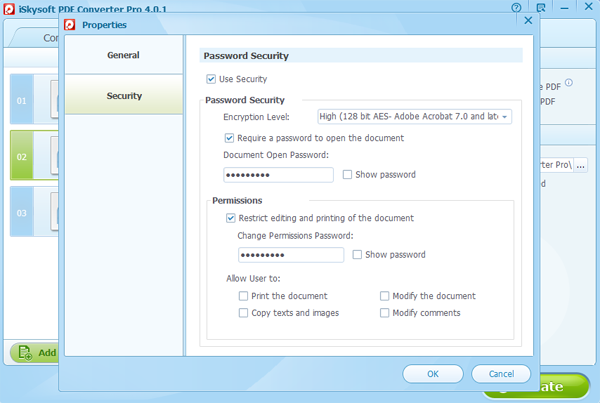 On PDF Converter Pro, you can set password protection to control PDF viewing, copying and modification. Click the Create PDF tab, then click the Add Files button to add the files you want to convert to PDF. Once the files are added,go to the advanced settings button on each PDF item bar. Click it to reveal the Properties dialogue box. On the box, click Advance…, navigate to Security. If you want your PDF viewable only to limited people, you can set a password to protect it from being opened. Check the Use Security box and set your password. People who know the password can open it. In addition, you can set permissions to protect the PDF from being copied, edited, and printed.